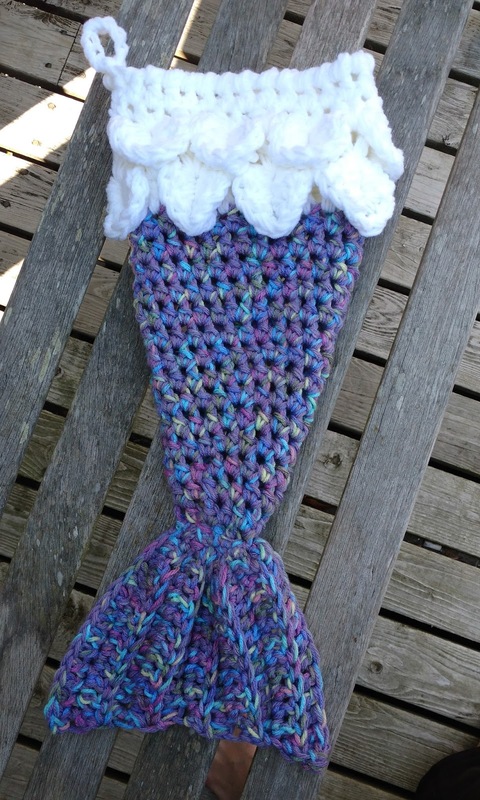 A FB friend recently tagged me in a picture of some adorable mermaid tail Christmas stockings. I searched for a pattern, couldn't find one quite like I was looking for - so I made my own. In the original photo the stockings were trimmed in some sort of white fun fur/eyelash yarn. I didn't happen to have any on hand, and I thought that scales as a trim would fit with the mermaid design better than a fur type trim. I have the pattern for sale ($2.99 CDN) on my Raverly page - help support more designs! It's been quite a while since I've had an online presence. We experienced a flood in our basement where my studio space is located and it was almost 8 months before I could get all of my supplies unpacked, I'm still not organized. I have what I call Artists Brain, meaning, my mind is always on the go, trying to find a way to stay creative. One recent rediscovered craft is crochet. I remember learning when I was very young, taught by my mother and paternal grandmother. So, to while the time, in addition to colouring, I started crocheting. Starting with the basics, chain stitches, single crochets. half double crochets and double crochets. Thanks for popping by, and keep an eye for my art - whether it be yarn, jewelry, or art of another kind.